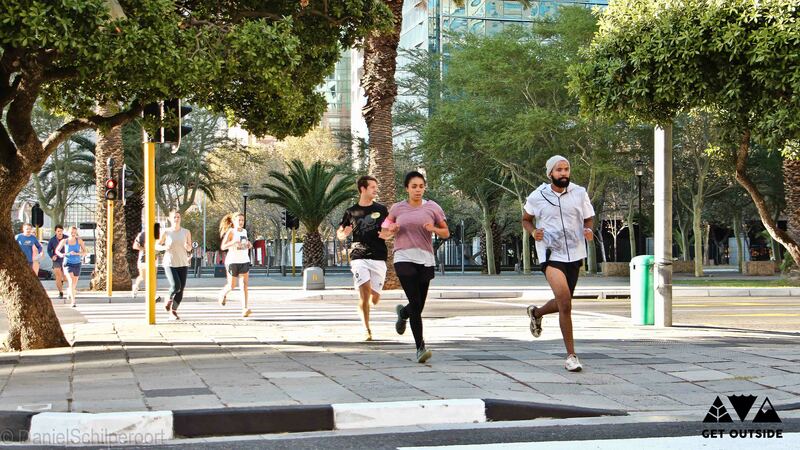 Running is often considered a cardiovascular activity with no strength benefits. This is obviously a misconception due to the fact that when pushing off, you are exerting forces that exceed two and a half times your body weight. Now imagine doing this 20 000 times in a row. If you are not strong, something will have to give out. When starting out as a runner, you should always try to incorporate some strength training into your schedule. Although you do need to be strong to run injury free, it’s not the raw strength that you get from lifting heavy weights. To be a functionally strong runner, you need to focus on being biomechanically sound. Most running injuries develop due to poor technique, and it is muscular weakness that promotes a bad posture when running. Since the hips are the center of the kinetic chain, they need to be as strong and functional as possible in order to transfer the rotational forces between the lower and upper body. Calves – The calves undergo huge amounts of stress during a run. Since the calf has biomechanical implications on the Achilles tendon and plantar fascia, by strengthening the calf you ultimately reduce the risk of sustaining an Achilles tendinopathy or plantar fasciitis. Furthermore, a strong calf promotes a stronger posterior chain, thus allowing for proper hamstring activation. Gluteus Medius – Biomechanical insufficiencies such as pronation (rolling in of the ankle) and medial knee deviation have been linked to several common running injuries. The poor movement patterns are a result of improper gluteus medius activation. The gluteus medius is the muscle that runs along the side of your pelvis and functions to abduct the leg. External and internal obliques – Running is a unilateral activity meaning that you are only standing on one leg at a time. This asymmetry tends to throw the body out of alignment. In order to keep moving forward, we have to compensate by swinging our arms opposite to the direction to our legs. So although everything seems to be moving forwards and backwards while we run, a lot of energy is used to rotate the body as well as to prevent excessive rotation. In order to do this you need to have strong oblique muscles. By activating them correctly and maintaining a stable, forward posture, you adopt a more efficient style of running. It is important to note that in order to be a strong runner, you do not have to be able to “lift” the most weight. This becomes obvious when you look at the world’s best endurance runners, the East Africans. They are by no means you traditionally ‘strong’ athletes, but what they are exceptionally good at is neuromuscular activation. This means that they use the right muscles at the right time and in the right amount. This is how they maintain such good form, even after 20 miles of running.